Dell, HP and Lenovo line up to support the tiny computer. Intel is making good on a CES promise to launch a computer that’s small enough to fit inside your wallet or purse. At Computex in Taipei on Tuesday, it showed off the first systems that will support its Compute Card—an ambitious attempt to popularize modular PCs. The card will begin shipping in August, but Intel hasn’t yet announced pricing. Most of the first wave of hardware will come from contract PC makers, but Intel said three big brand names are also working on devices: Dell, HP and Lenovo. The devices could range from laptop-like machines to tablets, displays and even digital whiteboards. Each will have a slot for Compute Card, and users will be able to plug the card into each device to use it. The Compute Card is a little bigger than a credit card and several times thicker at 95mm x 55mm x 5mm (that’s 3.7 inches x 2.2 inches x 0.2 inches). 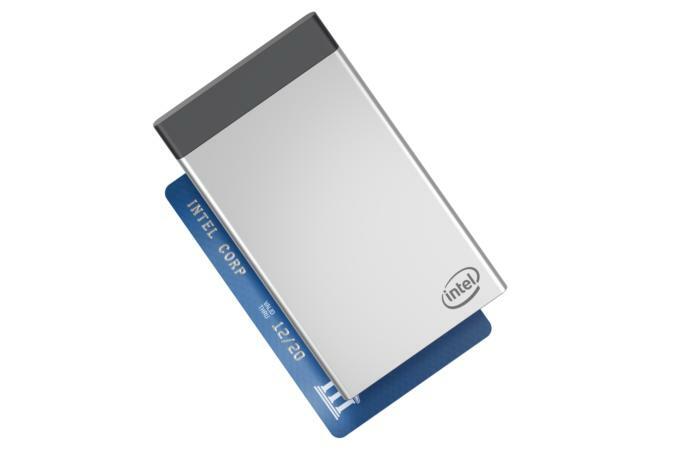 Intel’s Compute Card alongside a credit card. Despite its small size, there’s enough space to fit one of four Intel processors, from a Celeron up to a Core i5. The card also contains 4GB of DDR3 memory, flash storage (from 64GB of eMMC to a 128GB SSD); and WiFi and Bluetooth. On stage at Computex, the only traditional computer Intel demonstrated was a touch-enabled all-in-one PC from LG Display. It had a slot for a Compute Card in the side and was easily portable with a carrying handle built right into the top of the case. 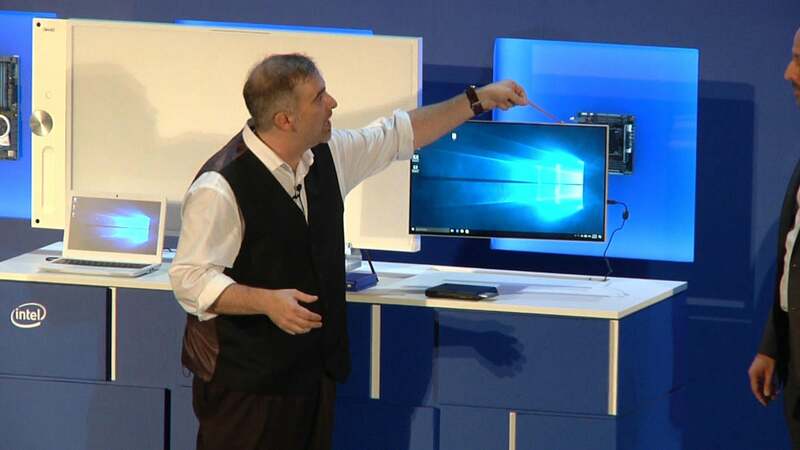 Intel’s Craig Raymond holds up a Compute Card enabled all-in-one from LG Display during a keynote at Computex in Taipei. Intel also showed a prototype laptop for students that’s powered by a Compute Card. The company envisions a student removing the card from the laptop, and popping it into a classroom whiteboard (Intel had a non-working prototype on display). Then, after school, the student could take the card and insert it into a desktop dock at home. The Compute Card architecture allows for easy upgrading, with more powerful cards replacing older models, allowing users to keep their systems fast and up-to-date. This isn’t the first time the PC industry has tried to popularize a portable computing unit that can plug into dumb terminals, but it’s the smallest and most compact attempt yet.